Lorain County Community College has been an important part of the Lorain County Community since 1963. Below are many of the significant events that have led to our success. Faculty from the Lorain Institute and Oberlin College petition State for Lorain County’s community college. Charter enter was granted on July 15, 1963. Max Lerner serves as LCCC’s first president. LCCC moves to its current location, making it the first community college in Ohio with a permanent campus. The campus opened with three buildings: Engineering Technologies, Mechanical Services and Physical and Social Sciences. Thomas Bowen serves as interim president. LCCC receives full accreditation by the North Central Association of Colleges and Schools, the highest-ranking accrediting association of higher education institutions. Omar L. Olson serves as college’s third president. The Health Sciences building opens. Learning Resources Center (first library) opens. The Stocker Arts Center opens and presents its first season. The Nord Advanced Technologies Center opens. Richard R. Mellott serves as interim president. Roy A. Church serves as College’s fifth president. The Mabel L. Ewing Activities Center opens. The John A. Spitzer Conference Center opens. Lorain County approves the creation of the University Partnership, bringing bachelor’s and master’s degrees to the LCCC campus. The University Center building opens to house the University Partnership program. The Patsie C. Campana, Sr. Engineering and Development Center opens. The first off-campus LCCC Lorain Learning Center opens in downtown Lorain at the St. Joseph Community Center. County Commissioners, Ohio Department of Development and LCCC create the Great Lakes Innovation and Development Enterprise (GLIDE), a regional business incubator to support all facets of the start-up, development and growth of enterprises. LCCC Enrollment tops the 10,000 mark in fall semester for the first time in the College’s history. Named one of the state’s fastest-growing colleges. The Lorain County Early College High School opens on campus. It provides first-generation college students the opportunity to earn both a high school diploma and associate degree simultaneously. LCCC Fab Lab opens. Provides students and community the ability to conceptualize, design, develop, fabricate and test new ideas. The second off-campus LCCC Learning Center opens in Wellington. The Entrepreneurship Innovation Center opens to inspire, support and connect entrepreneurs. GLIDE moves into EIC. LCCC Foundation launches Innovation Fund to assist emerging technology entrepreneurs. Lorain County Growth Partnership launches – a countywide partnership effort to help create jobs and support industry needs. NEO LaunchNet opens on campus to provide free access to business and entrepreneurship support services for students and alumni, regardless of their area of study. Barbara and Mike Bass Library/Community Resource Center opens. 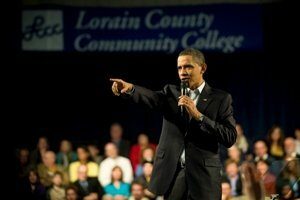 President Obama visits LCCC and hosts Town Hall meeting on campus. College’s enrollment tops 13,000 in fall semester; a 120 percent increase in just a decade. Renovated College Center building opens. President Obama endorses the start of LCCC’s Innovation Fund America, a program in concert with the American Association of Community Colleges Virtual Incubator Network that will equip other community college with the tools and support to implement this program to stimulate high tech entrepreneurship in their communities. Innovative Learning Opportunities for Tomorrow (iLOFT) opens in renovated building that was the original college library. The Norton Culinary Arts facility opens between the Stocker Arts Center and Spitzer Conference Center. LCCC prepares highly qualified graduates for the hospitality and tourism industry here as well as supporting activities at Spitzer and Stocker centers. 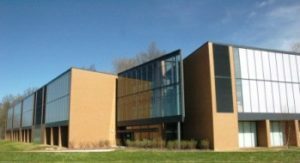 The University Partnership Ridge Campus learning center opens in North Ridgeville. It is home to LCCC’s Health Careers Simulation Center, Advanced Digital Forensics Institute and University Partnership bachelor degree programs in Computer Science and Engineering from The University of Akron and Computer Information Systems from The University of Toledo. The Laboratory Science building opened. It is a full service science laboratory space for microbiology, biotechnology, general chemistry, organic chemistry, geology, physics and anatomy and physiology. It also supports upper level chemistry courses through the University Partnership. The Richard A. Desich SMART Commercialization Center for Microsystems opens. It is a shared resource facility that focuses on commercializing sensor products by utilizing the manufacturing processes of Micro Electronic Mechanical Systems (MEMS). The LCCC Lorain Learning Center relocates to the City Center location on West Erie Avenue. Marcia J. Ballinger serves as the sixth president. LCCC Community Learning Center opens at new Lorain High School. The Patsie C. Campana, Sr. Engineering and Development Center was re-imagined and expanded to become the Campana Center for Ideation and Invention. It is a digital manufacturing lab equipped with high-tech equipment for fabrication, automation, 3D printing and more. LCCC is authorized to offer Ohio’s first applied bachelor of science degree in microelectronic manufacturing – positioning it to help address the unmet talent needs of industry. Lorain County Community College was named the top community college in the country for Excellence in Student Success by the American Association of Community Colleges (AACC). The AACC is the primary advocacy organization for the nation’s 1,200 community colleges.